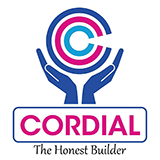 "Cordial" has earned a reputation for consistently delivering high quality construction services in a timely and cost-effective manner. This one quality, coupled with a host of various other qualities that come with our experience in the industry, is what brings us more clients. At "Cordial", there is no compromise on quality because there is a perfect understanding among the project managers, architects, suppliers, sub-contractors and all those involved in the project with a single-minded goal of delivering what is promised. Being the best is not just a slogan, it is a way of doing business and that is our hallmark. Integrity and honesty are the core factors of Cordial`s business. We maintain high ethical standards in everything we do, both in our work and in our personal lives. This culture is imbued into our people from the moment they enter the company.